The various ways Japanese print buyers customized their ukiyo-e in days gone by brings a smile to the face as well as tears to the eye. Sure, even full-size, multicolor prints were cheap enough in the 19th century, about the price of a bowl of noodles, and it is always fair to try and personalize a collection, but every playful action with scissors and paste and black ink brushwork back then — montaging and retouching actors' faces, brushing in comments on the paper about beauties and landscapes, etc. — represents a nibbling away of our inheritance today. Fortunately, not everyone seeking extra fun with ukiyo-e needed to vandalize gorgeous works. Publishers also made available less important prints, called tatebanko, that were specifically designed to be cut up and assembled into dioramas. There were also still cheaper, tiny-format prints for children, termed today omocha-e (toy prints). Intriguingly, several types of prints were produced consisting only of the black outline of the kabuki actor or beauty, with no overlay of color blocks. One such type of key block print (tameshizuri-e) resulted from the process of print-making itself — i.e., a black and white state had to be run off for the artist to make color notations on — and it is speculated that another few impressions were made for inventory purposes. After all, as long as a record existed of the exact outline of a print, one could work backward, perhaps years later, and reproduce the necessary blocks. However, enough examples of tameshi-zuri-e have survived perfectly intact to suggest that such reduced, minimalist ukiyo-e were also released commercially, presumably at a cost far lower than even soba. 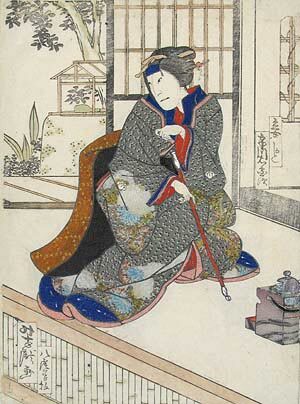 In this case the foundation is a tameshizuri-e of a chûban print by the Osaka artist Yoshitaki (1841-99), showing the actor Ichikawa Udanji c, 1865 in the role of Mekake Kashiku. 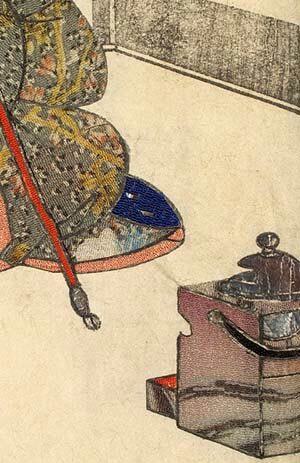 Note the meticulous care with which the wood grain of the portable brazier has been evoked (Fig. 2) as well the painstakingly-executed ukiyo-style draping lines of the kimono. Also, a few elements of the background have been delicately hand colored, but not so much as to detract from the ingenious oshi-e handiwork. In actuality, oshi-e examples with room props and a background like Fig. 1 are rather rare. This is because most extant 19th century pieces seem to have been executed on top of yet another type of ukiyo-e — simplified, slightly smaller-than-chûban, figure-only keyblock print called nuri-e, which will be the subject of a Daruma article in the near future. But why, then, do we find tameshizuri impressions of standard prints? For serious coloring enthusiasts? For very low-end market actor print fans? Nobody seems to know, but that’s okay: as the wise folk say, guessing is more fun than knowing. This article originally appeared in Daruma, no. 30, Spring 2001. Copyrighted © text and pictures reprinted with permission.